Rubbish Review by Josephine Rose "Roses"
This card worked fine in my SD900 HD camcorder and I filled half of it in about 2 hours. I have since seen similar cheaper but when you pop into Boots and see the prices there, you just gotta laugh. Who do those numbnuts think they're kidding? Incompatible Review by John K "John K"
It's a bargain for the money asked. 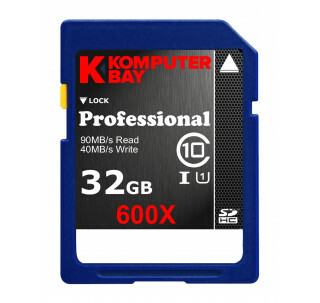 In the future, if needed, I would buy again the same Komputerbay 32GB. Bought for our new HD panasonic camcorder. Works great and gives lots of storage for our videos. 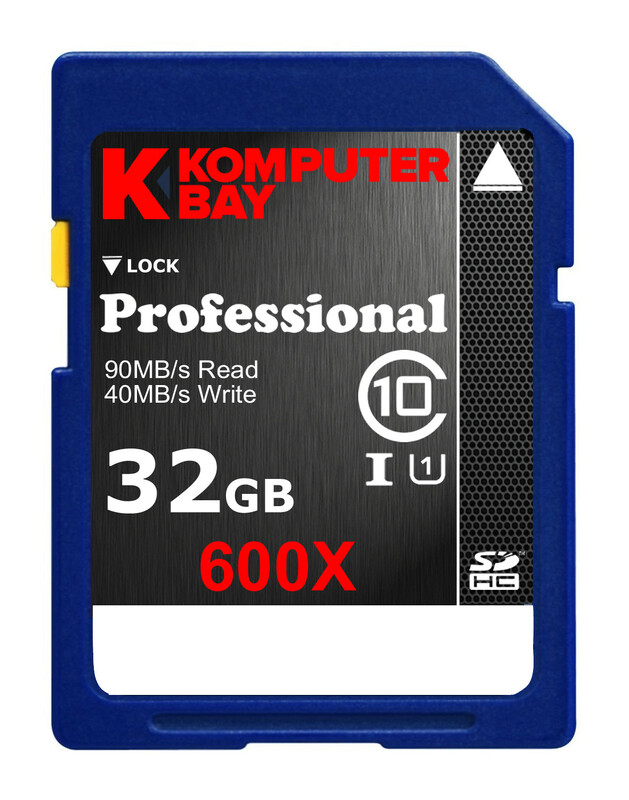 Top performance with excellent economy - so far so good Review by T. Lockyer "Reddening"
I bought 2 KomputerBay 16GB Class 10 SDHC Ultra High Speed Memory Card - Read 20MB/s Write 15MB/s to use on a month long holiday in OZ & NZ as I was hoping to use them for video recording using my Lumix FZ100. In the event I recorded very little video but 750 or so hi res photos with excellent results. Both the videos and photos were perfectly recorded and read back without problems on my laptop card reader despite passing through several airport Xray security machines. I knew that buying an unimposingly packaged budget card from a "no name" supplier was taking a risk with precious photos which could not be replaced but several people had reported good results and I thought I'd give them a trial, though I also took along a couple of higher quality Sandisk cards in reserve. However I needn't have worried as I had no problems with The Komputerbay cards. When I first plugged the cards into my camera it told me that the they were not capable of recording the highest quality HD video however I expected that I would need to FORMAT them in the camera before I used them and sure enough once I had done this the warning message went away and they recorded HD quality fine. Another foble I noticed, which maynot be anything to do with the card, was that some photos that initially played back fine at a later viewing reported "can't play this file" error on the camera LCD. I thought at first that my worst fears were realised and the files were corrupt but I noticed that these photos had been taken in portrait orientation and I had rotated them on a subsequent viewing. These photographs played back perfectly fine on my PC when I downloaded them from the memory card in the card reader so I can only assume this issue was to do with the camera not liking to play rotated images. One card and 750 perfect photos (not even a quarter full card) and 15 mins or so of video doesn't constitute a lot of exerience with this product but it's one data point and so far so good. The case package seems robust too so I don't expect to have cracked case problems as I've had with Integral Ultima Pro cards at a slightly higher price and spec. Don't be put off, Review by W. R. Saunders "Plainview"
The product is perfect for a few uses. I got mine a year ago and used it 15/20 times (by use it I mean insert it on the camera slot and then remove and insert it on the MacBook Pro SD slot) and it's falling apart. I actually got 2 cards and both of them have the same problem, first the top plastic part broke and now the little plastic parts that divide the part from where the card connects with the computer are breaking one by one. I can still use the card (it functions very well) but I have to be very careful for not leaving unwanted plastic parts inside my MBP or my camera. I'm a careful person and I've owned Verbatim and Tranced SD cards for 5 years, both fine to this day. Ordered and delivered within 72 hours (which included a Sunday). The card arrived held in a large plastic clamshell that had a printed product sticker on it; the clamshell was loose in an Amazon cardboard packet. The back of the card was marked 'Made in Taiwan' with serial number 'LTSD110632GB'. The card itself was blue with a plain black and white no-name label on it. Given the numerous fake cards being sold out in cyberspace I ran the H2testw program (version 1.4) on the card. This returned a result of a 30GB formatted card with a write speed of 14.4MB/sec (comfortably exceeding its Class 10 description, although not achieving the full 15MB/sec advertised), and with a read speed of 16.1MB/sec (again not achieving the fully advertised 20MB/sec). My Canon 550D reports space for about 3500 high-detail JPEGs at 18mp, while my Panasonic TZ7 shows enough space for just under 5500 high-detail JPEGs at 10mp. Having just received it, I can't yet comment on its longevity. Item dispatched and received extremely quickly after order placed. SD Card used for recording HD film in Panasonic camcorder. Used extensively on holiday and no problems experienced at all. SD Card recognised by Laptop, Panasonic Blu-Ray and TV with no problems. Very pleased with test results. Atto Disk Speed Test Benchmark showed Max Write 21070 mbs; Max read 21881 mbs. A very well balanced card. Warning: Only 122741 of 122742 MByte tested. Very Fast or is it? Review by D Deacon "pixist"
Komputerbay 64GB SDXC 40/90 Card arrived via Amazon from Komputerbay. I plugged it into a Kingston MobileLite G3 USB 3.0 card reader/writer and used the ATTO tests to check its speed (see ATTO screen grab above) and got some very good results 90/90. However, in the real world writing and reading files I got 26/34. Do they write special code to favour the ATTO or other tests? I note too that the label on this card is not the nicely printed and positioned one shown by Amazon but is a laser printed wonky one - see images above of front and back. It might end up eating shots or video I want. If they can't manage to put the label together well, then the rest is likely to be as cheap and so unreliable. I think I'll return it and get a better brand. I got a quick reply from KomputerBay tech support. They acknowledge the card as theirs from the numbers on the back and say that a shortage of labels caused the laser-printed ones to go out to Amazon. They say the next lot will have properly printed labels. From CrystalDisk's site, I gleaned that one of their tests is incompatible with Norton and so will not run; I found this to be so on Sandisk as well as KomputerBay cards. I had an issue with using it in a Nikon D3200 in that it would format but then claim it needed formatting - it did that a number of times. KomputerBay says that their card is compatible with the D3200 and, if not, it could indicate a faulty card. I've never had an issue with Sandisk 64GB SDXC or 32GB SDHC cards or a 7Dayshop 32GB class 10 or Transcend cards. Today, I tried it again and ensured the contacts were clean and the card seated properly and it worked okay. I can say that it worked okay in a Sony 5N, 5R and a Panasonic V520 camcorder. so not as fast as claimed by the seller. Nevertheless I'm fairly happy with their performance. I bought two of these to use with my Nikon D7100 which supports SDXC cards and in both cases the camera reported that these cards could not be formatted. I formatted them to exFAT in Win8 and tried to use them but the camera then basically said, 'Cannot use these memory cards'. Good news first; my read and write tests confirmed that it was not a fake and, indeed, all 32GB of it was perfectly usable. Unfortunately, it didn't even come close to living up to the claimed read and write speed in my case. Writing 1gb files onto the card until it was full (using the f3write test utility) happened at a disappointing 4.2MB/sec, while reading these files back went along at 10.7MB/sec. Both of these speeds, particularly the all important write speed, fell well short of the claimed speeds. All in all, good value for money, but it's certainly not worthy of it's class 10 rating. I was slightly disappointed that for an SDXC card it did not come exfat formatted. However, that was easily sorted out on my laptop. Two clicks and I did the exfat formatting on it (in less than a minute). The card has worked very well up to now!! I've now tested it fully with my Cannon 1100D camera - and it works absolutely brilliantly. Even in continuous shooting with photo settings in RAW format there is no problem at all. I'm talking files that are around 15-20MB each - and this card just soaks them up like effortlessly. If you stay in RAW format files you get well over 3000 shots on my camera. For the highest quality shots that are around 8-10MB my camera reads 'over 10000'. So really for most high quality shooting it's difficult to run out of space in a day's shooting. It works well with video recording. I've not done any long videos on it so I can't comment on files that would be over 500MB. But whilst shooting video the card functions without a glitch. You just don't know it's there.. which is great!! The card is surprisingly speedy at transfering photos to the computer. I didn't time it because it was so very fast. So overall it soaks um up and hands them over very very nicely! I've not had a need for the USB reader - as yet - but it's cool to have. It works fine. Good card! Review by Captain Walker "- make it so! Having bought this item I ran some tests on it to make sure it was "what it said on the tin". I have been caught out a couple of times buying from a well known auction site only to find the cards are fake or substandard. I bought this one through Amazon to hopefully get a "real" product. Unfortunately, it wasn't so. I copied 16GB of video to this card and used "exactfile" to check-sum those files to ensure they were identical to the originals. Beyond 2GB, there were multiple discrepancies. This set alarm bells ringing that this might not really be a 16GB card at all. Bought two of these and thoroughly impressed with them. Great price - less than half the price of the same size card from a 'named' supplier. Used them in my new Fuji HS20 EXR - taken loads of camera 'test' shots / full HD 1080P videos in all conditions etc. & had no speed/delay problems with them. Using this for my Panasonic TZ10 camera. Gives around 6250 photos at 12.1mps and the tranfer rate tested at 18.6mbps when benchmarked. Not much else i can say really. Recieved this promptly after ordering. Works great in my GoPro HD sports/action camera using full 1080p resolution. GoPro doesn't transfer files at the stated speed of this card, but using a card reader that I purchased on another site I manage 21MB/s read and 15.5MB/s write while transferring single large video files. I've been using it about two months now and in general have had no problems but if I have to specify certain ocations I would say that there's been quite a few times when trying to record a video it has stopped automatically because it was working very slow. I have to admit that recording an HD video at a bitrate of 40 mb/s, as my Canon EOS 550D does, can't make it any card, but knowing that this is a class 10 card shuldn't be any problem as the minumun required for my camera is a class 6. Another thing I'd like to point out is that using a Sony 8 GB Class 4 card whith the same camera doesn't give me any trouble, what does that mean? That actually a Sony Class 4 performs better than a KOMPUTERBAY Class 10? At first I thought that the problem would be because the hard was almost full (29 GB out of 30,9 GB) but the other day happend the same thing and the card was EMPTY. It started recording 3 seconds and stopped. I've had this problem a few times, and I was lucky I wasn't recording something important, but what will happen when I'm recording something that really matters? Having read the glowing reviews I went ahead ,despite concerns re the company name, and purchased the card with high expectations. Didn't need to use it for over a month but when I used it over the weekend the camera formatted the card and the card took 2 pictures before the camera began overheating in an effort to transfer an image to the card. It then rejected the card and refused to use it. I took it in to a reputable dealer who took one look at it and my description of the problem then spent half an hour trying to get it to work.At which point he took the card from the camera and stated that' The card is either a fake which there have been a lot of lately or it is faulty and he advised me either way to return it to place of purchase. Amazon do not accept returns after 30 days so it looks like I'm stuck with a peice of junk. Having never heard of Komputerbay before and given that there were only a couple of reviews for this same (presumably) card but without the included USB 2.0 Reader ... I decided to take a punt and buy this at the same time as buying a shiny new Nikon Coolpix L22 Digital Camera and some of these Energizer Ultimate Lithium AA [6 For 4 Pack] batteries. Last test - Dragged & dropped a 699MB AVI file onto the SD drive and it wrote to the card in about a minute. Popped card into USB reader and went to shove it into the USB slot on the front of my Sumvision Phoenix Premium DVD player (which doesn't play disks anymore) only to notice for the first time that the player already has an SD/MMC slot on the front. Expecting a failure with this as it doesn't say SDHC (High Capacity) ... sure enough - "bad card" error ... Card yanked out and shoved back into the USB reader and fire it into the USB slot on the player and BINGO ... as sure as Robert's your Mother's Brother the card contents pop up on screen much faster than any of the other memory-stick/pen-drives I've used before. I bought one of these for my Panasonic HDC-SD90 which I used on a recent trip to Crete. I set the recording quality to maximum and this gave me over 8 hours. Great! Around 2 hours of video files recorded fine but, while videoing a scene, I unexpectedly got a "Card Full" warning on the camera screen followed by a "Check Card" (ie the camera can't read the file system on the card). I stopped using the card immediately. On return to the UK I tried various free Windows data recovery programmes (ZAR, Media Investigator, Aid File Recovery, Stellar Phoenix). None of them could find a file system but a couple found 2 strange jpg files of a teapot which I didn't take! As an almost last resort I tried formatting the card both in Windows 7 and in the SD90. Both format attempts failed so I believe the hardware controller on this card has failed. I have used SDHC and Sony Memorystick cards in AVCHD cameras for several years. I know what not to do and have never had a data corruption. I am sending the card to a professional data recovery company who may be able to unsolder the core memory chip and read files off it directly. I will update my review with the results of this "final" last resort. Hi Nigel, this is definitely a fake card. Probably is 4GB, maybe 8GB but certainly not 64GB. NAND is rebranded also, so is probably of a low grade meaning is less reliable than traditional grade 1 Flash memory.